WHERE: Mobtown Theater is located in the Meadow Mill complex at 3600 Clipper Mill Road in Hampden. Directions to the theater are available on the website. TICKETS: $15 (general admission) and $12 (students and seniors). The Mobtown Players present the Baltimore Premiere of Electra by Euripides. The story begins and ends with murder. When Electra was a young girl, her father King Agamemnon was killed, and, to avoid the same fate as his father, her brother Orestes was smuggled out of the country. Now a grown woman, Electra has been forced into a marriage with a farmer and exiled to rural Argos. 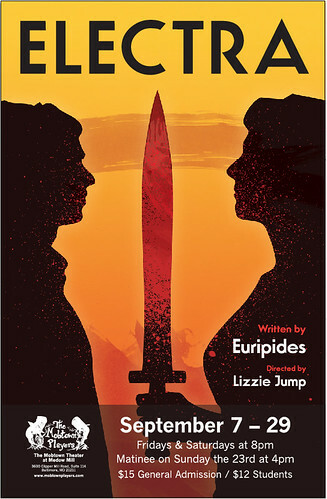 She dreams of the day when she and Orestes are reunited and avenge their murdered father by killing the people responsible—their mother Clytemnestra and her lover Aegisthus. But when the siblings are reunited and their father’s death avenged, will Electra and Orestes find the justice and rewards they expected? Or do the gods have a different fate in store for those who murder a parent in the name of piety and revenge? One of Baltimore’s most popular theater groups, the Mobtown Players were founded in 1998, finding a permanent home in Hampden in 2003. The non-profit theater company is dedicated to making both classic work and contemporary plays accessible to a wide variety of audiences.